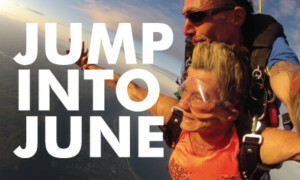 76 year old Margaret-Anne Hayes parachuted out of a plane to raise funds for cancer research. Through sponsorship, Margaret-Anne raised $28,000 for Ovarian Cancer Research in the Bill Walsh Translational Cancer Research Lab, at the Kolling Institute, Royal North Shore Hospital. Thank you Margaret-Anne, you are one amazing lady!